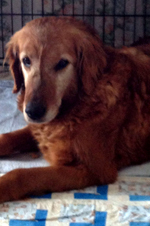 Bio: My name is Duchess and I was very lucky to be rescued from a puppy mill where I had lived for all of my nine years. I must have been a good mom because they kept me around so long, but I bet my beautiful red coat and friendly face helped too! 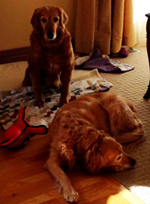 GRRIN has put me in a foster home where I have a Golden buddy, Gracie, and we are almost exactly the same age. Gracie has taught me how to enjoy running around the backyard, sleeping next to the bed, carrying toys, and eating in front of humans at regular mealtimes. My foster family is very patient and they understand that I am just not going to be a typical Golden that crawls in their lap for snuggling, but I do like to touch them with my nose and will sometimes take a treat. I’m an old gal and will need to re-adjust with whomever adopts me -- I definitely require a dog buddy and some mellow humans. You might not be able to tell from my actions, but I am very grateful to have a new life!